Three classes of students began this year time traveling to 1982 in a classroom painted with nature murals and dominated by two massive taxidermied bears, listening to teacher Dan Hubacker tell the story of the United Anglers of Casa Grande High School. In 1982, wildlife biology teacher Tom Furrer was lecturing on endangered species when he was challenged by a student who asked why they should care since there was nothing they could do. Later, a troubled Furrer tried to walk off his frustration and ended up in the dry streambed of Adobe Creek, close to the Casa campus. While walking, according to the Anglers’ history, he met the elderly Charlie Malnati, who had lived next to the creek his entire life. Malnati showed Furrer a small group of trapped fingerling steelhead trout. Malnati recalled the creek, alive and healthy, and how, as a child, he loved to watch adult steelhead trout migrate through his backyard. Adobe Creek had been diverted decades earlier to be a source for city water. It was considered dead, the streambed littered with cars, tires and trash. Here was Furrer’s answer. He spent two years studying the ecosystem, then challenged his students to get hands-on and local, save the native Adobe Creek steelhead and restore the creekside habitat. Thirty years later, all water diversions have been removed by the city. Anglers worked, year after year, to clear the streambed of 25 tons of debris and plant trees to provide shade and habitat. Steelhead and salmon return to the creek to spawn. And a hatchery was built on the campus, run by students and overseen by Furrer until his retirement, now by Hubacker. Hubacker shows the students clippings and videos. Anglers has been profiled in Reader’s Digest and on ESPN and CNN. He talks about how the hatchery was built from private donations. The group has been handed new honors. National Marine Fisheries and the University of California, Berkeley, want United Anglers to participate in a study of Chinook salmon. And the NMH and Department of Fish and Game have proposed a full recovery program for the Petaluma watershed, to be implemented with the help of the United Anglers. Students also learn how to run a hatchery—by running one. 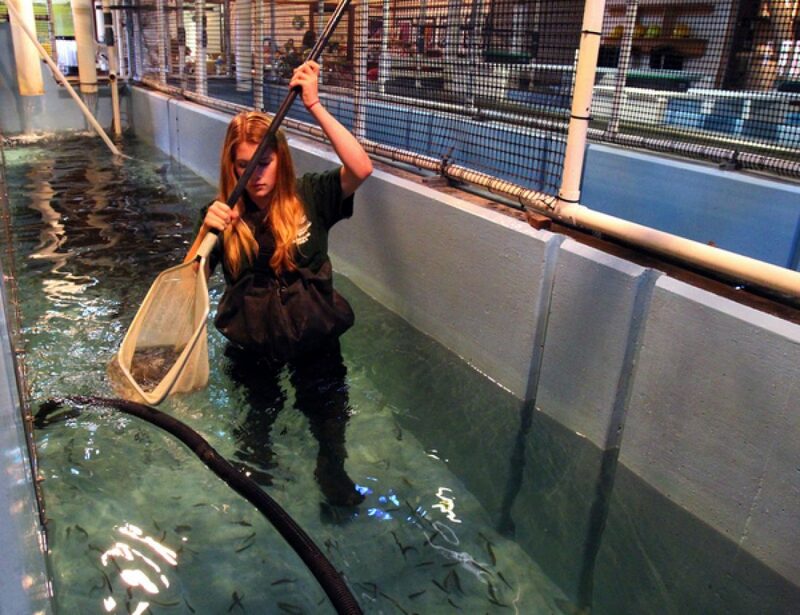 What the Anglers have is unique as far as Hubacker knows, the only full-scale, student-run hatchery on a high school campus. Furrer laughed and said, “Yeah. We’ll see.” He explained what it would take—the science degree, the commitment.